Since her death at the age of nineteen in 1431, Joan of Arc has maintained a remarkable hold on our collective imagination. During the tumultuous Hundred Years War between England and France, a young peasant girl nicknamed "The Maid" (La Pucelle) followed her heart and came to the aid of her nation. Facing unimaginable odds, Joan's belief in her mission from God continued to propel her forward. Within months, she was directing soldiers and bravely fighting for her nation. Joan became a national hero and was the guest of honor at her King's coronation. However, her success and fame ultimately and ironically became her undoing.Neither wife nor nun, neither queen nor noblewoman, neither philosopher nor stateswoman, Joan showed the world that anyone who follows their heart has the power to change history. 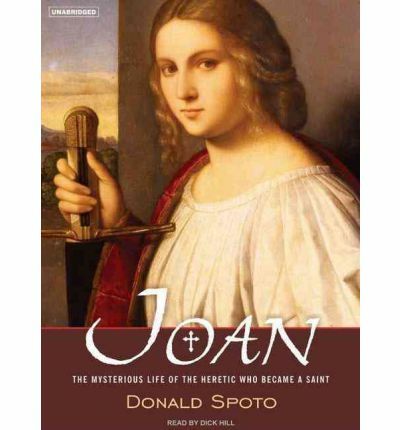 About the Author: A prolific and respected biographer and theologian, Donald Spoto is the author of twenty published books, among them bestselling biographies of Jacqueline Kennedy Onassis, Alfred Hitchcock, Tennessee Williams, and Ingrid Bergman. His books have been translated into more than twenty languages. Donald Spoto earned his Ph.D. in theology at Fordham University. After years as a theology professor, he turned to fulltime writing." The Hidden Jesus: A New Life", published in 1999, was hailed by the "Los Angeles Times" as "offering a mature faith fit for the new millennium." His successful biography of Saint Francis was published in 2002. Spoto lectures worldwide on important topics such as theology, the arts, and social issues. Note: This mp3 audio book is in mp3-CD data format. This means that it will only play on a cd player specifically prepared to run mp3-CDs. It as well can be loaded onto a personal pc and copied over to a mixture of mp3 players and played on them.